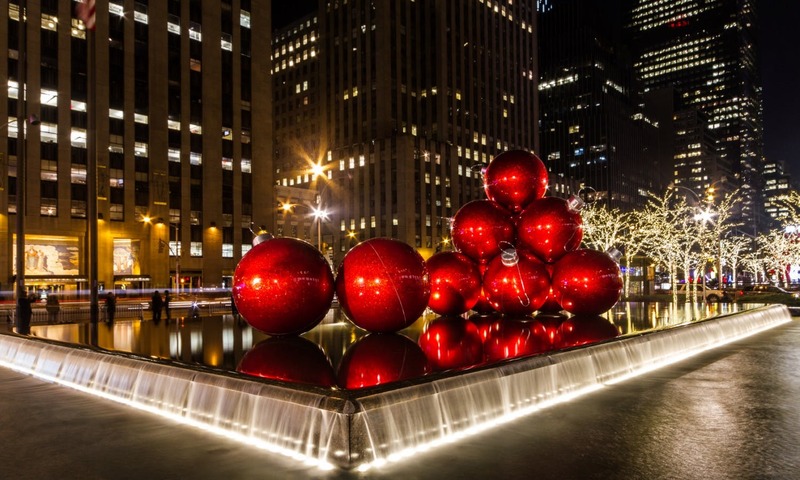 There’s no better place to celebrate the holidays than New York City. Amanda Coletta, a New York City native and hotel concierge, shares the best ways to get into the holiday spirit in her hometown. If Hollywood has taught us one thing, it’s that there is no place like New York City during the holidays. The colors, the lights, the people, window displays, magical shows, and of course the people. Did I mention the people? Christmas in New York is the busiest time of the year, but there is a vibrant energy that cannot be replicated anywhere else. Well, there is the legendary giant Christmas tree, ice skating, and the Christmas Spectacular with the Rockettes at Radio City Music Hall. Three of the most popular holiday traditions within a one-block radius. Add in the Fifth Avenue’s store window displays and yikes! Can you say crowded? But, did you know that New York has plenty of other Christmas alternatives that are just as festive, just as awe-inspiring, and usually a lot less crowded? At the Bryant Park Winter Village, the tree is lit twenty-four seven and is surrounded by a charming market selling an array of holiday gifts and wares. 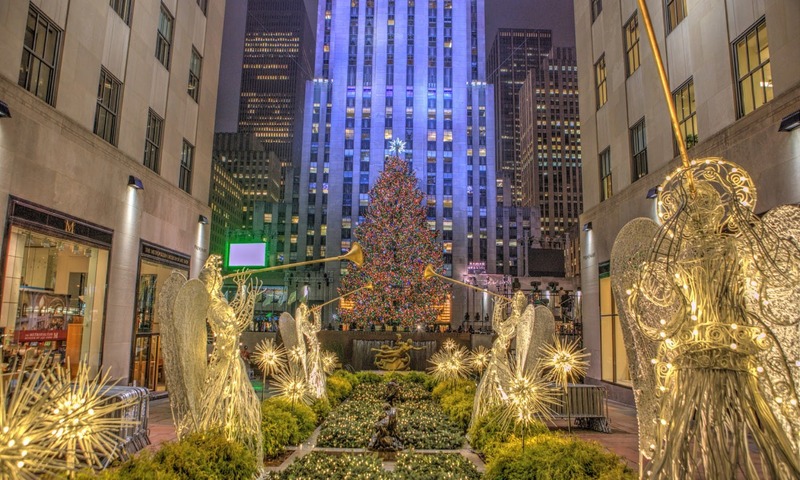 This might be the best alternative to Rockefeller Center! 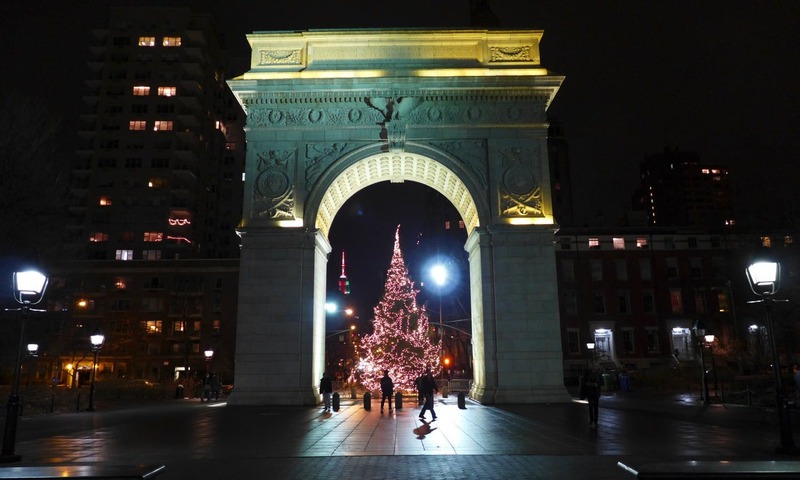 Washington Square Park has an illuminated tree directly under the arch which makes for a great photo op. At Lincoln Center, there is a tree at Dante Park across from the plaza. A great option if you are going to see The Nutcracker! Did you know Madison Square Park had America’s first community Christmas Tree? While in the neighborhood, have a frozen custard at Shake Shack, a bite to eat at Eataly, or take a walk to the Union Square Holiday Market. Don’t miss the park’s Gingerbread Boulevard. There is a “hidden” tree at the Bloomberg Building (58th Street between Lexington and Third Avenues). Perhaps hidden is the wrong word as it is quite large and surrounded by the circular glass Bloomberg Building, but many people don’t know about this tree, a truly unexpected surprise that happens to be my personal favorite. At the Metropolitan Museum of Art, there is the Angel Christmas Tree and Neapolitan Baroque Creche. This display is lovely, totally different than any other. The tree has 50 angels while the creche (nativity scene) is put into the tree and comprises eighteenth-century hand-crafted figures and ornaments. Holiday concerts also occur in the hall throughout the season. The American Museum of Natural History has an Origami Tree with more than 500 origami ornaments. The 2016 theme is “Dinosaurs Among Us” in honor of the museum’s “Cuba” and “Dinosaurs Among Us” exhibitions. Feathered dinosaurs and modern birds are on display. Where to go skating? 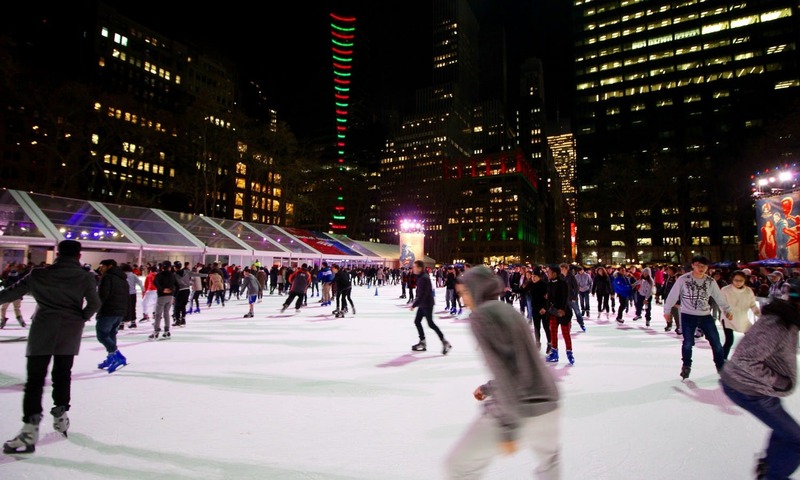 One of the best alternatives to Rockefeller Center is the ice skating rink at Bryant Park which is larger and free (the only cost is skate rental). But there are a few lesser-known options as well. One of the newer skating traditions is at Brookfield Place in the financial district. The shopping center hosts the outdoor skating rink, visits with Santa, and “Luminaries”, a light installation by the Rockwell Group comprised of 650 suspended lanterns that perform a holiday light show every two hours. For ice skating with a more grown-up edge, check out the rink at the Standard Hotel. The Standard plaza is transformed into a Swiss chalet, and when you’re finished skating cozy up with a Hot Toddy. 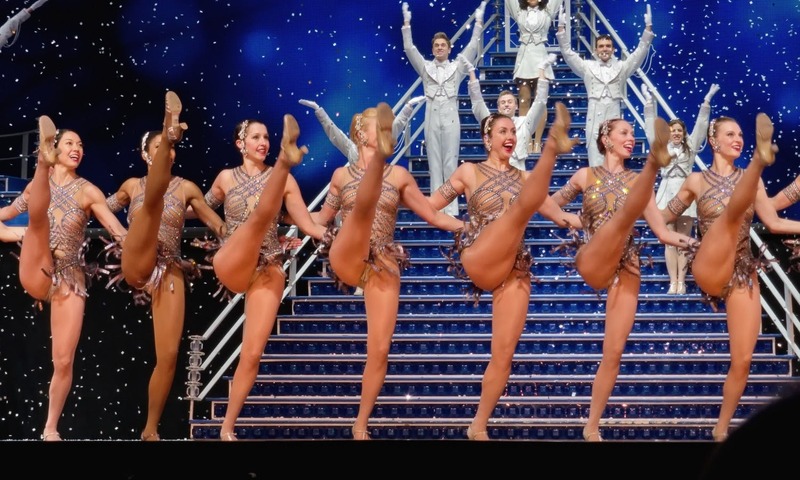 How many years have you seen the Rockettes do their famous kick line? Looking for a different holiday experience? Of course, the other popular tradition is to see the New York City Ballet perform George Balanchine’s The Nutcracker at Lincoln Center. While the production is stunning, it is higher priced and tends to sell out. Did you know there are many other smaller Nutcracker productions being performed over the holidays? Some favorites include Dances Patrelle’s The Yorkville Nutcracker, Mark Morris’ The Hard Nut, and the Joffrey Ballet School’s production. Not excited about ballet? The theatre at Madison Square Garden will be performing Rudolf the Red-Nosed Reindeer. Barney’s, Saks Fifth Avenue, Lord & Taylor and Bergdorf Goodman are all famous for their holiday window displays, but you might be looking to see enjoy the charm of holiday decor without the hovering crowds? The New York Botanical Garden’s Holiday Train Show is a wonderland! More than 25 trains are on display traveling through 150 scenes of New York during the holidays, all created with natural materials such as bark, leaves and berries. There are winter concerts at the gardens, poetry readings, arts and crafts for the kids, and even Bar Car Evenings with cocktails for the adults. Taking the Metro-North Railroad back to Grand Central after the Botanical Gardens? Stop at the New York Transit Museum Annex and check out their own smaller train show. 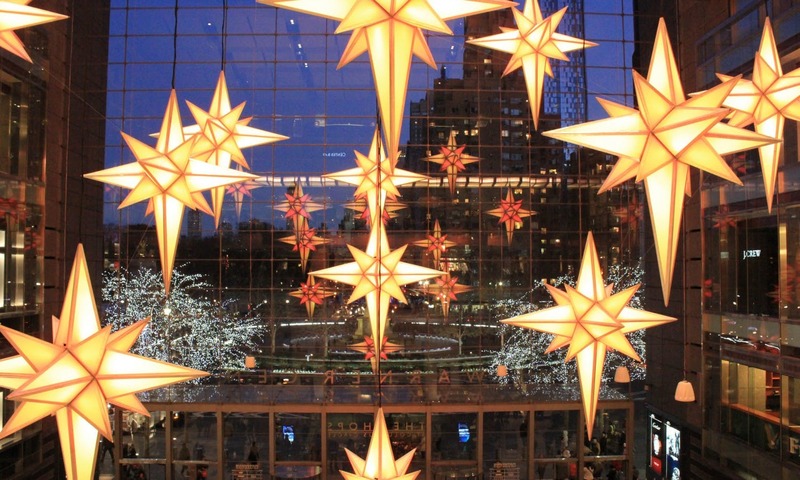 If you find yourself shopping at the Time Warner Center, be sure to take a look at “Holiday Under The Stars” comprised of a dozen, 14-foot stars, dangling above the main entrance and changing color to the tune of festive holiday music. On Monday evenings, this coincides with “Broadway Under the Stars”, a free concert series from some of the most popular Broadway Shows. A holiday light show and free Broadway Concert? Only in New York, folks. Born and raised in New York, Amanda Coletta received a BFA degree in dance and musical theatre from Marymount Manhattan College. Starting as a concierge at Grand Hyatt New York she was then part of the opening team at the flagship Andaz Fifth Avenue until opening the flagship Park Hyatt New York; New York’s newest 5 star, 5 diamond property. She travels the world writing and blogging and still performs as an actress doing improv and sketch comedy. Follow her on Instagram at @amandacoletta.